Kagawa Prefecture (香川県, Kagawa-ken) is a prefecture in the Shikoku region of Japan on the island of Shikoku. The capital city is Takamatsu. Kagawa was formerly known as Sanuki Province. Drought is common in Kagawa history. For example, in 1973 the region was called "the Takamatsu desert". Kagawa is in the northwest part of Shikoku. The prefecture borders Ehime Prefecture in the southwest. 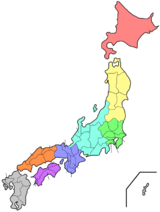 Tokushima Prefecture is in the south. Kagawa has a coastline with many small islands on the Seto Inland Sea across from Okayama Prefecture. The prefecture built 17 dams between 1947 and 1974. National Parks are established in about 11% of the total land area of the prefecture. ↑ Nussbaum, Louis-Frédéric. (2002). "Kagawa prefecture" in Japan Encyclopedia, p. 446; Japan External Trade Organization(JETRO), Kagawa Prefecture, Regional Information; retrieved 2012-4-6. ↑ Nussbaum, "Takamatsu" at p. 934. ↑ 4.0 4.1 Berga, L. (2006). Dams and Reservoirs, Societies and Environment in the 21st Century, Vol. 1, p. 41. ↑ Japan Ministry of the Environment, "General overview of area figures for Natural Parks by prefecture"; retrieved 2012-3-13. ↑ "Nationwide List of Ichinomiya," p. 3; retrieved 2012-2-9. This page was last changed on 31 August 2017, at 05:18.